We find out more about Wilderness Safaris, an eco-tourism operator that has camps across the African continent – and is putting local art and culture first. Established in Botswana in 1983, Wilderness Safaris is one of Africa’s leading eco-tourism operators, but there is more to this holiday provider than meets the eye. Dedicated to conserving and restoring Africa’s wilderness, the company operates in seven countries with over 40 camps; Wilderness Safaris aims to protect the flora and fauna in some of the most pristine, remote areas of Africa, helping to conserve the environment and aid the local communities that live in these areas. 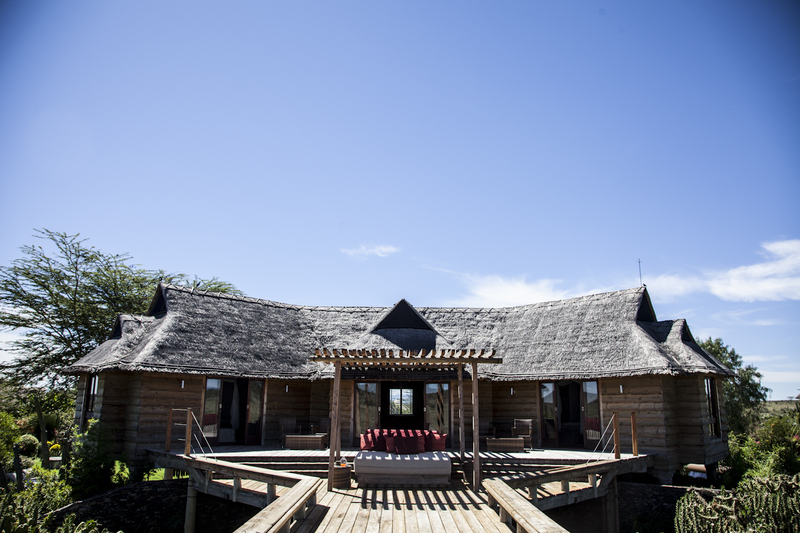 The eco-tourism operator not only supports the area around its camps, but is acutely aware of its own footprint on that area when building its properties. 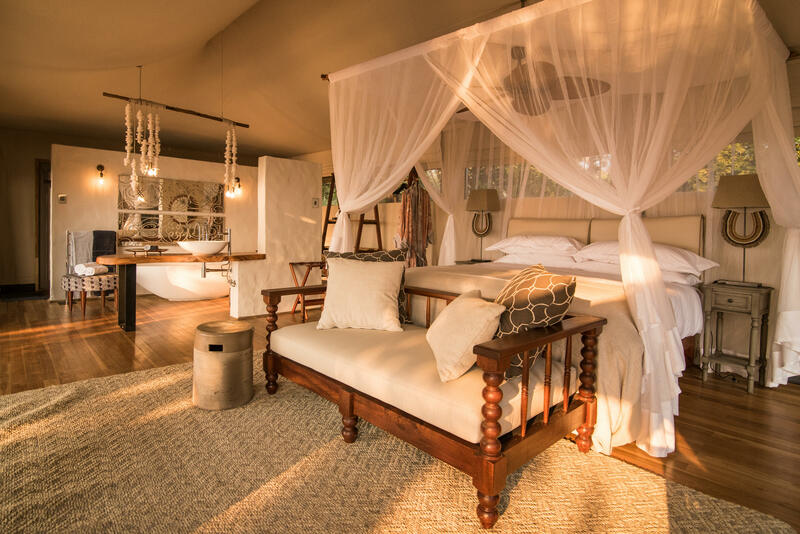 Over the past few years, and continuing into 2019, Wilderness Safaris has moved from strength to strength, opening several new spots and completely rebuilding some of their classic camps in countries including Namibia, Zimbabwe and Rwanda. 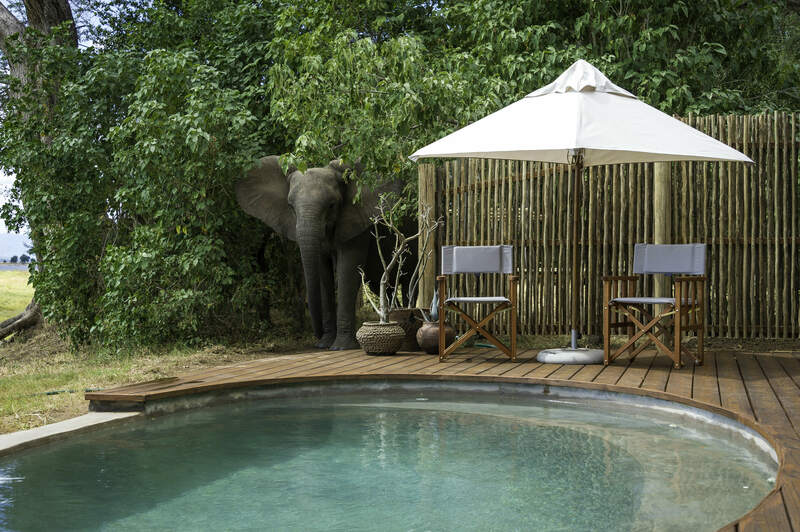 Many of Wilderness Safaris’ camps are opened as ventures with local governments and conservation areas, meaning that the camps have to adhere to a strict policy when it comes to their design. All of the camps can be completely disassembled, and use local and sustainable materials as much as possible. 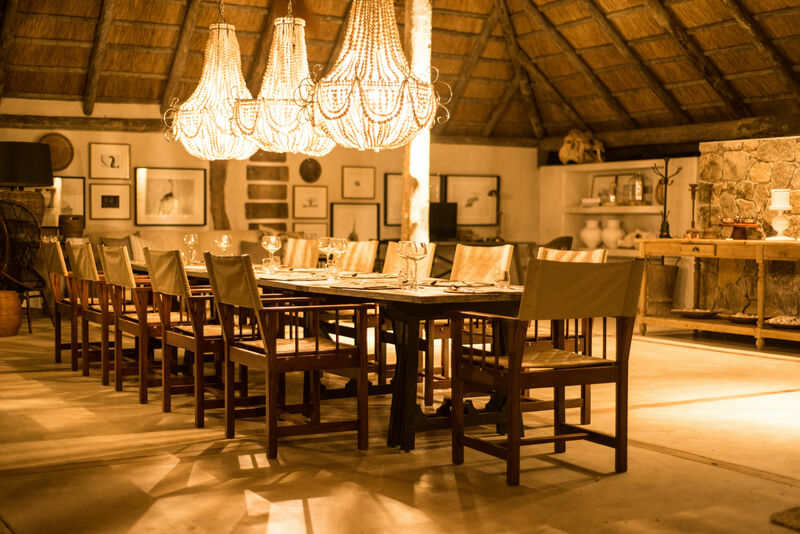 As well as a having a close relationship with local designers and architects, Wilderness Safaris maintain a strong artistic focus when setting up any of their holiday spots. In this article, we’ve chosen to highlight four of Wilderness Safaris’ camps, to discover more about the company’s dedication to art. Wilderness Safaris’ new Chikwenya camp, in Zimbabwe’s majestic Mana Pools National Park, has been designed to take advantage of the spectacular views of the Zambezi River and Rift Valley; its interiors have been designed by Tanja Beyers to capture the spirit if the nature that surrounds it. 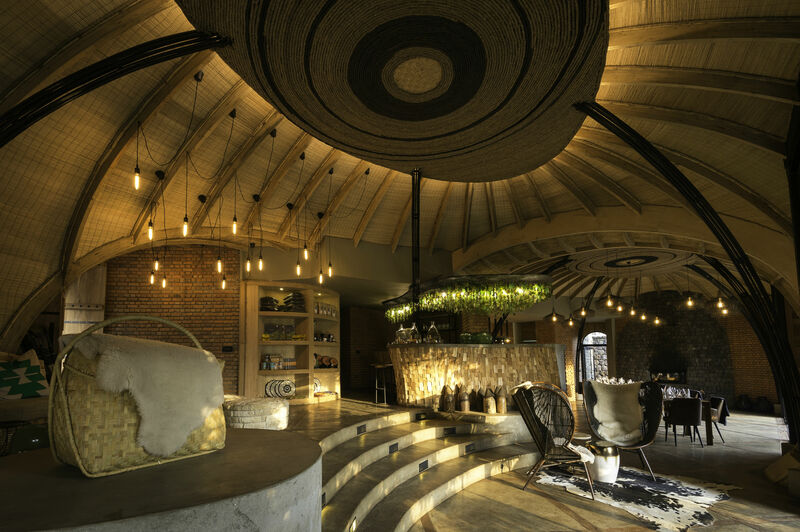 Beyers brought in a number of handcrafted elements when creating her interior design, in order to celebrate the culture and art of the local peoples. “We kept all of the design elements as authentic and real to the surroundings as possible – making it comfortable without overdressing it,” explains Beyers. 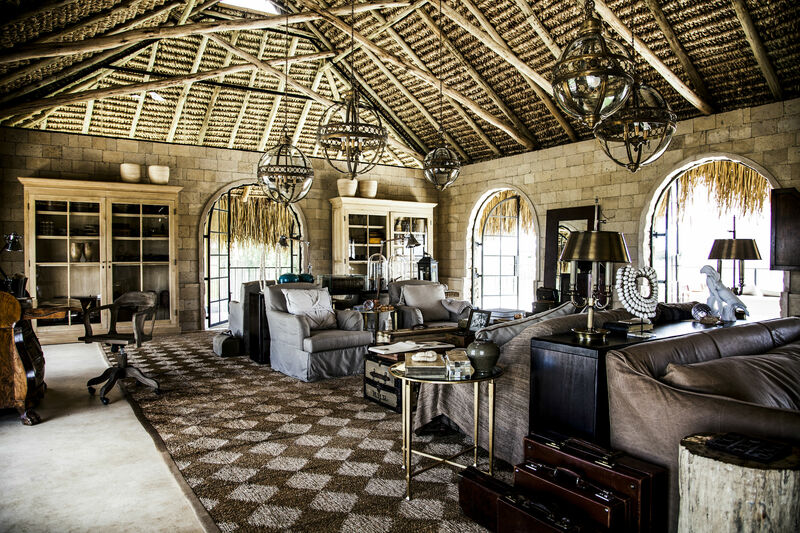 This includes the handcrafted daybeds, and the beaded chandeliers that hang in the main lounge. In total, over 15,000 individually hand-rolled beads and 7,000 discs were made to create the chandeliers, and 34 local families benefited from the income generated in making these works of art. During October 2018, one of the other camps within Mana Pools National Park – Ruckomechi – played host to a local Zimbabwean artist, Liberty Shuro. 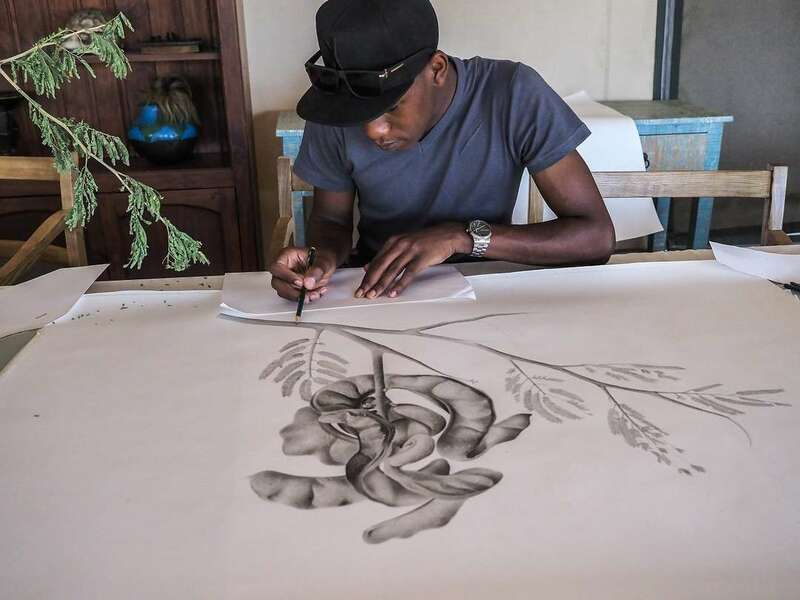 The camp’s dining area was in need of a remarkable art display, and after seeing Shuro’s botanical artworks in an exhibition at the Everard Read Gallery in Johannesburg, the Wilderness Safari team invited the young artist to stay at the camp and explore his local wilderness. Wilderness Safaris also commissioned Shuro to create a piece of artwork that would sit in the camp’s dining area. The only brief was for the piece to that it needed to create a link between the wildlife that depends on the environment, and the camp’s natural setting – forming a cohesion between the Ruckomechi camp and the wilderness that surrounds it. The final piece, made in graphite and charcoal, depicts a cluster of seed pods from the Faidherbia albida (ana tree). The Faidherbia albida are trees that grow in and around the camp, and the animals often come in to the camp to eat the seeds; Shuro’s artwork perfectly demonstrates the relationship between the camp’s environment and the wildlife that live in it. 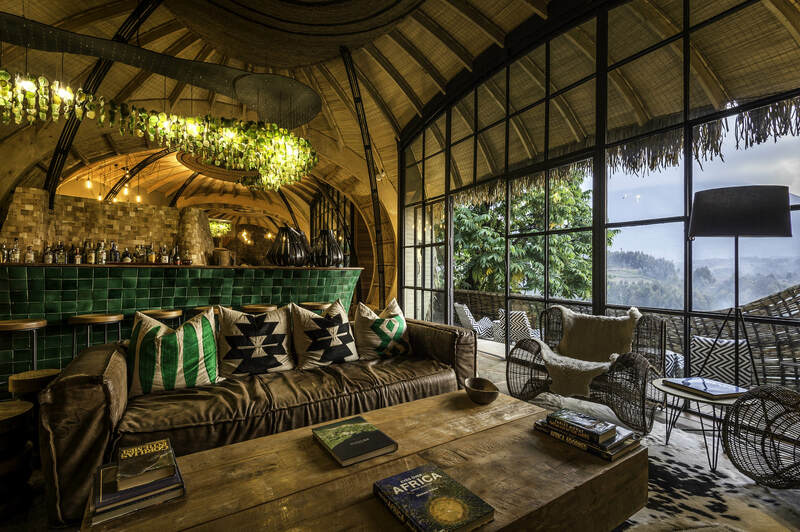 At Bisate Lodge, a Wilderness Safaris camp in Rwanda, the interiors also highlight the relationship between the camp and its surroundings; this time, from a cultural point of view. 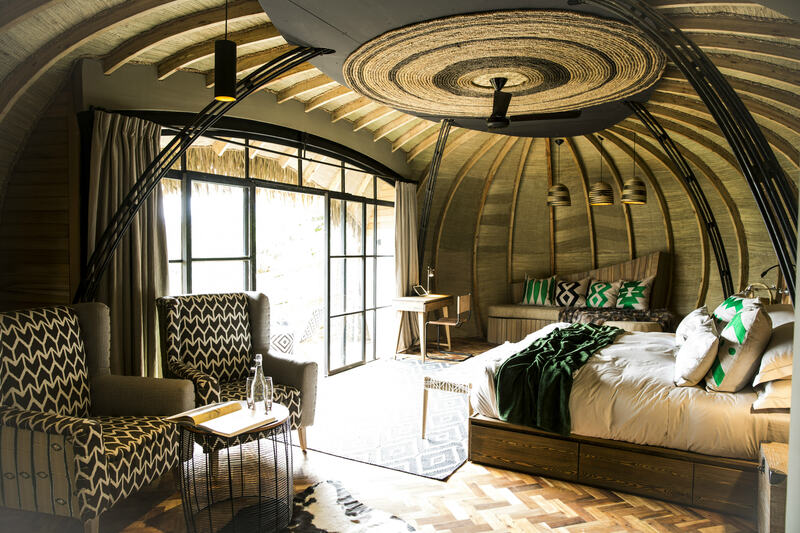 Bisate opened in June 2017, and Rwandan fashion entrepreneur Teta Isibo was appointed by Wilderness Safaris to design its interiors using locally-produced products. “As a designer who focuses on fusing traditional Rwandan craftsmanship with contemporary design, the Bisate project was super exciting for me as I felt its design embodied this same principle”, Isibo said of the brief. As a result, Bisate’s interiors draw from a range of aspects influenced by the Rwandan lifestyle. For example, black and white cow hides have been used throughout the interiors, reflecting on the local peoples’ rural way of life. Many of the furnishings in the camp have also been decorated using imigongo, a unique Rwandan art form that goes back hundreds of years. This particular art form uses cow dung, which are mixed with different coloured soils and painted onto surfaces in geometric shapes. The celebration of art is a theme that runs through many of Wilderness Safaris’ camps, no matter their location on the African continent. In fact, Segera – a camp in Kenya that lies in the grasslands of the Laikipia Plateau – is the east African hub of the Zeitz MOCAA. The Zeitz MOCAA (Museum of Contemporary Art Africa) collects, researches, preserves and exhibits art from Africa and its Diasporas; the main museum is located at the V&A Waterfront in Cape Town, South Africa. As the east African hub of the museum, Segera plays an important role in promoting the Zeitz’s collection of artwork, displaying culturally and socially challenging pieces from the collection throughout the camp. As well as conserving the natural beauty of the African continent, Wilderness Safaris are constantly working to safeguard cultural heritage and strengthen intercultural understanding; and nowhere is this better seen than in the company’s devotion to art and culture.